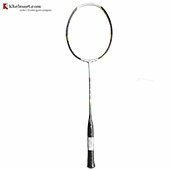 Khelmart presents you all new and latest 2018 badminton racket collection at best price range. 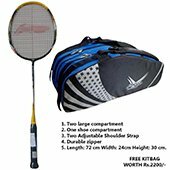 At Khelmart, we have best and latest range of rackets from Yonex, LI Ning, Thrax, Carlton, Ashway, Apacs and other brands. 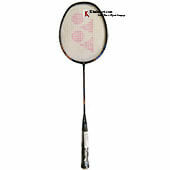 Recently Yonex introduces brand new Astrox series in which Astrox 99 is the hot selling product for professional players. 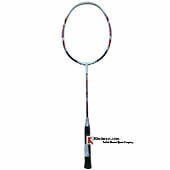 This racket is used by Japanese player Kento Momota. 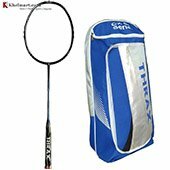 This racket is developed with rotation generation system which gives extreme power on shots based on counter weight balance theory. 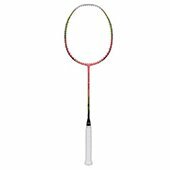 Further, in Astrox series, Yonex introduces 3 new models in Year 2018, Astrox FB, Astrox 22 and Astrox 5Fx . 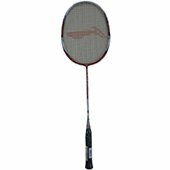 Among the Astrox series, Astrox FB is ultra lightweight racket in 5U weight category. Astrox series is developed for attacking game style and while rotational generation system complement its head heavy nature which amplify its power and counter attack. 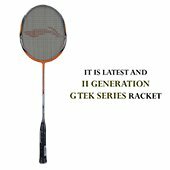 # Yonex Voltrc FB is launched in year 2018. FB stands for flash boast which is light weight racket (76 Gms). 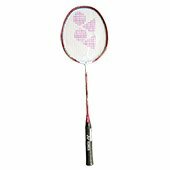 Voltric 7 DG, 1DG and 10 DG are ultra strong frame concept by Yonex in year 2018.Voltric 1 Dg is very popular model for beginners to intermediate players. 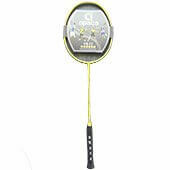 In fact it is the Best Yonex Racket for Intermediate Player who already tired basic Yonex racket and now wants to use hi modules graphite racket. 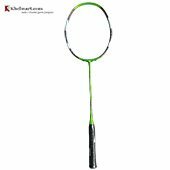 # Yonex 2018 Voltric series is equipped with latest Tri Voltage System which offers powerful smash and speedy racket handling for better counter attack game. 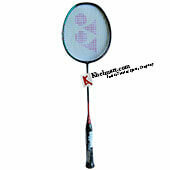 In Voltric series, Voltric z Force II is popular racket for attacking game style. 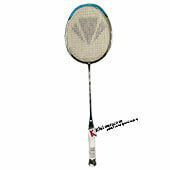 ZF II is already used by lots of international players like Lee Chong Wei. 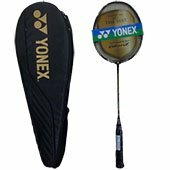 # In Arcsaber and Nanoray Series, Yonex introduces the 5U racket in year2018. 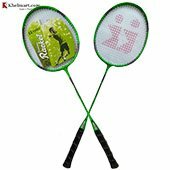 Yonex Nanoray Light 11i and Arcsaber light 15i the most popular models in lightweight series. 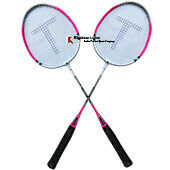 Also, these rackets are Best Yonex Rackets under 2000 Rs. 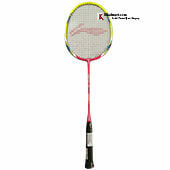 Yonex Nanoray light series is developed for those players who are looking for better power and light weight racket. 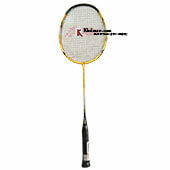 It is developed with Hi modules graphite material in which player can use 28 Lbs string tension. 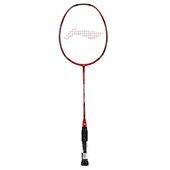 # Yonex Muscle power series is also a good option for beginners. 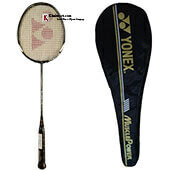 Yonex MP Series racket like, Yonex Muscle Power 29 Lite and Yonex Muscle Power 22 Plus are Best Rackets for Beginners. 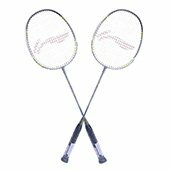 # In 2018, Yonex Duora series rackets are very popular among the players, Yonex Duora 77 LCW and Duora 77 are the Best Rackets for Intermediate Players in Duora Series. 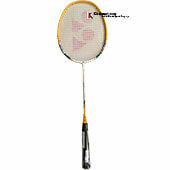 Duora series are equipped with dual optimum frame which gives two fold benefits to players, .i.e. Powerful forehand and speedy backhand. 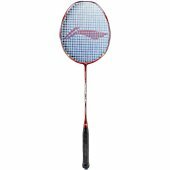 # Yonex Duora 10 and Duora Z Strike are the pro level rackets. 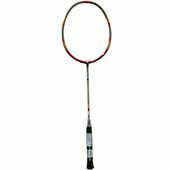 Duora z Strike racket is used by Viktor Axelsen. We all know the deceptive playing skills of Viktor Axelsen. 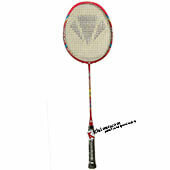 Duora z strike is considered as best racket for offensive play. 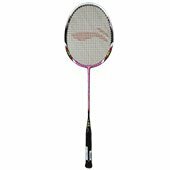 # In 2018, Li Ning Ultra strong series is getting very popular in players who are looking for mega strong frame and light weight racket. 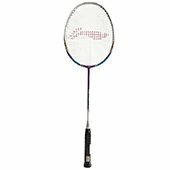 LI Ning Ultra Strong series rackets look similar to Yonex DG series by checking the configurations of rackets. 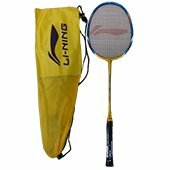 LI Ning US series is developed with Hi Modules graphite material which provides racket frame a unique ability to sustain higher string tension. # In US Series, US 978 and US 988 are two best selling model along with US 930. 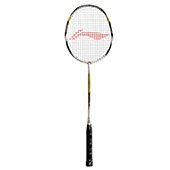 # Further, in 2018, LI Ning introduces its feather lightweight rackets known as Windstorm 72, 75 and 78. Windstorm 72 weight is just 72 gms while its frame can hold the string tension up to 30 lbs. 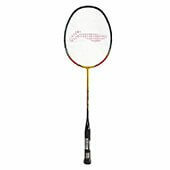 # Windstorm feather weight series is suitable for those players who love to play with light weight racket while looking for high repulsion form racket. 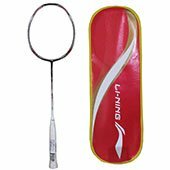 # Similarly, for intermediate players, LI Ning launched its Nano Power series in 2018. 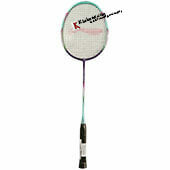 Nano Power series is developed with HM graphite and enhance resin structure frame and shaft. 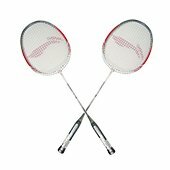 These rackets provide better strength and power on shots. 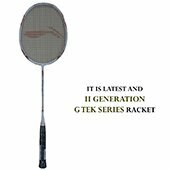 # LI Ning also launched its HI power series in 2018 similar to G Tek series. In Hi power series, Shaft is made of graphite while its frame is made of aluminum alloy. 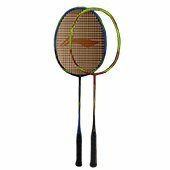 Victor introduces its Aero Speed & Arrow power racket series in 2018. 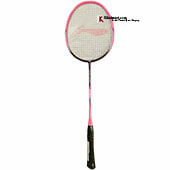 Latest models in Arrow power and Arrow speed are developed with HM graphite with Nano Tec Technology. Nano Tec technology provides better material characteristics which helps player in making good drive, fast counter attack shots. # Recently, Victor introduces the Aura Speed racket in 2018. 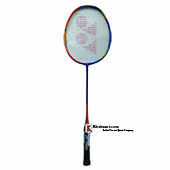 Aura Speed series is developed for advance badminton players. Aura 70F is the flagship model. Thrax introduces its complete racket series in 2018. 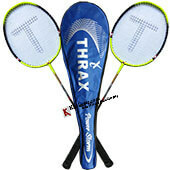 Thrax introduces furious, Streak, Rapid and Astra Series for beginners to all round type of players. 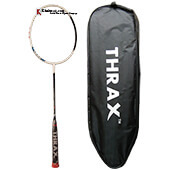 Thrax Astra series is very attractive series and if you check its specification and its cost than it will emerge as top of line racket. Apacs badminton is emerging as quality badminton equipment manufacture in India. Apacs finapi series is already a hit series and lots of intermediate players are using it. # In 2018, Apacs introduces lots of new racket series like Blend, Defender, Faray and many more. 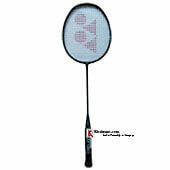 The main qualities of Apacs racket are its price and attractive specifications. 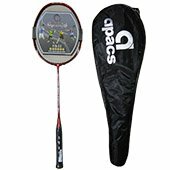 Apacs rackets are its low price and better quality as compare to other popular brands. 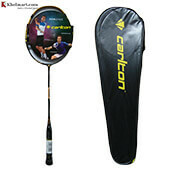 Selecting a perfect racket as per individual game style and aspiration level is very important. These parameters impact the player performance up to a great extent. Aspiration level of player needs to be check properly by his/her coach or mentor. 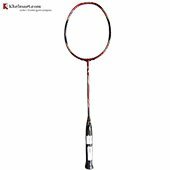 If a player is serious for making Badminton as carrier option then he needs to carefully check the playing style. 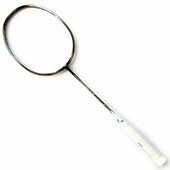 For serious player, proper guidance is also important for selecting the racket. 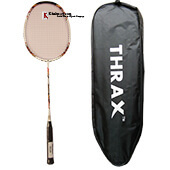 # Head heavy racket gives more power on shots as it’s generate more momentum due to mass distance from hinge point. 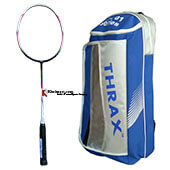 # Head Heavy racket are suitable for those player who wants more power in shots. 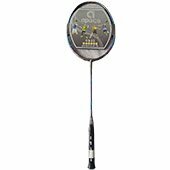 # In head heavy rackets player may feel sluggishness in swing speed due to weight towards head side. 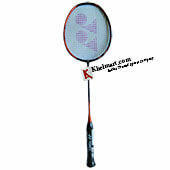 # Head light racket gives racket swing speed. # Player who wants fast racket handling will like this type of balance. 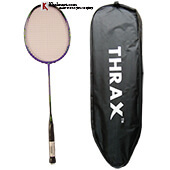 # With head light rackets player can do better counter attack and enhance the deceptive skills. # Add lightweight grip on handle. Flexible shaft gives better bending while it comes under shuttle contact. Different manufacturing companies use different material to make shaft flexible. 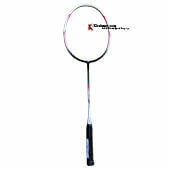 Like Yonex use HM graphite to make shaft, on other hand, Li Ning use graphite material to make shaft flexible. Flexible Shaft provides following performance advantages to player. Flexible shaft bends under the shuttle impact and store the energy. During release of energy , it amplify the power and helps player to hit powerful smashes or 3rd line clear. 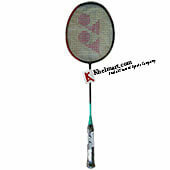 Quick repulsion is suitable for drive shots, quick return to opponents. As shaft bends during shuttle impact and hold the shuttle for longer time. This phenomenon holds of shuttle and creates direction instability. So, player may feel some level of direction instability with flexible shaft. 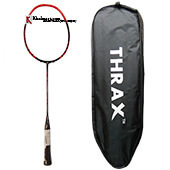 Modern racket comes with additional innovation to overcome this problem. 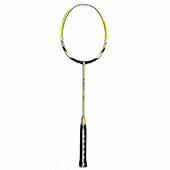 For E.g., Yonex used T Anchor technology to minimize the vibration in flexible shaft. 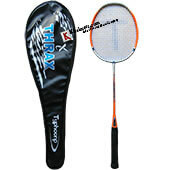 Flexible shaft with modern technologies will be suitable for those players who want all round type of game play. Player with defensive playing style will definitely like to play with flexible shaft. Stiff shaft gives very less or stiff bending when shuttle hits the string bed. Due to less or stiff bending, player gets more power on shots with better directional control. 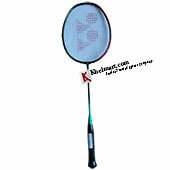 As shuttle repelled from racket quickly so racket offers optimized repulsion to badminton players. With optimized repulsion, player can put more power to shots with more stability and direction control. With stiff shaft player gets stable head which results into less frame vibrations. 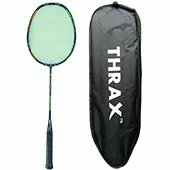 Due to less vibration and stable head, player can effectively place the shuttle into opponent's court. 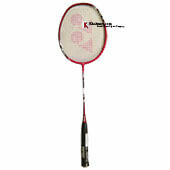 Stiff shaft racket are suitable for attacking game style as it generates explosive power. 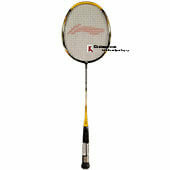 With stiff shaft player gets lighting fast racket speed which helps in placing quick return and fast drive shots. 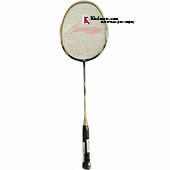 Different types of head shapes can be produced but two types of head shapes are commonly known in racket manufacturing. A. Isometric head shape gives enlarge sweet spot area by which player gets more opportunities to hit off-center shots. 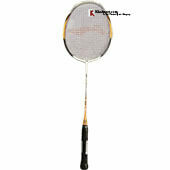 B. Isometric head shape offers best aerodynamic to racket frame. A. 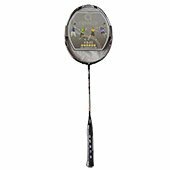 Oval shape head gives low sweet spot area which minimizes the opportunities to hits off-center shots with more power. B. 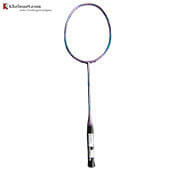 Oval head shape gives fast racket swing speed. 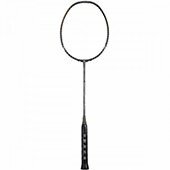 Weight of the racket is very important and it puts direct impact on player performance. 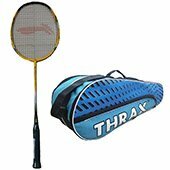 Heavy racket considers good for powerful game but heavy racket gives sluggish swing speed whereas lightweight racket gives fast racket speed and quick repulsion. 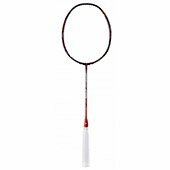 Yonex use U nomenclature to define the racket weight and it is like 2U (90 to 94 gms),3U (85 to 89 gms), 4U (80 to 84 gms) and 5U (70 to 75 gms). 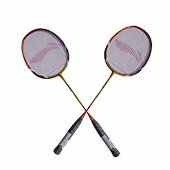 Most of the professional racket comes without string because different string can change the paying characteristics of the racket. And professional player wants customize stringing option. www.Khelmart.com , Best Online Sports Shop in India with variety of sports goods. 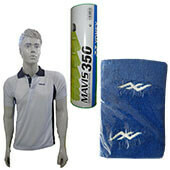 Best deals, best price , best quality and branded products. 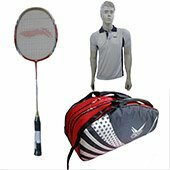 At khelmart you can buy sports goods online at competitive price with free shipping and COD options. Khelmart practices K.O.S (Khelmart Operation System) and KQS (Khelmart Quality System) which gives user better online shopping experience every time. 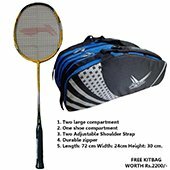 Khelmart deals in Cricket , Badminton , Tennis , Football , Basketball , Table Tennis , Nutrition , Health Supplement , Fitness products online. Our continuous improvement in process and quality enable us to achieve our goal .i.e. “To Become India’s Best and Trusted Online Sports Brand”. Thanks!